The New Mexico State baseball team got off to a hot start in WAC play by winning its first two series. The Aggies took two of three games from both the California State Bakersfield Roadrunners and the Chicago State Cougars in late March. In between the two WAC series, the Aggies defeated their inner-state rival, the New Mexico Lobos. The Aggies went into their first series against a WAC opponent with a 15-5 record. New Mexico State welcomed the CSU Bakersfield Roadrunners to Presley Askew Field March 22–24 for their first matchup against a conference foe. The Aggies lost the first game to the Roadrunners by a final score of 4-9. The next day, the Aggies were able to overcome their loss and defeated the Roadrunners 23-1. They had 20 hits on the day, and it was the fourth game of the season where the Aggies score more than 20 runs. The final and deciding game of the series went to the Aggies as they edged out the Roadrunners, 12-9. Following their first weekend series in conference play, the Aggies hosted their inter-state rival, the New Mexico Lobos on March 26. The Aggies jumped out to a quick 4-0 lead in their first at-bats, but the following inning they allowed the Lobos to score four runs of their own to tie the game heading into the third inning. The Aggies would get six runs in the next couple of innings to take a 10-4 lead heading into the fifth inning. The Aggies would not look back from there and were able to get the win against their rival by a final score of 13-5. The Aggies then traveled to Chicago to take on the Chicago State Cougars for another WAC weekend series March 29–31. The Aggies again were able to take two of three from their WAC opponent and win the series. The Aggies won the first game 9-2, but came up a little short in the second game as they lost, 3-7. In the final game of the series, the Aggies left no doubt who the better team was as they defeated the Cougars 12-0. 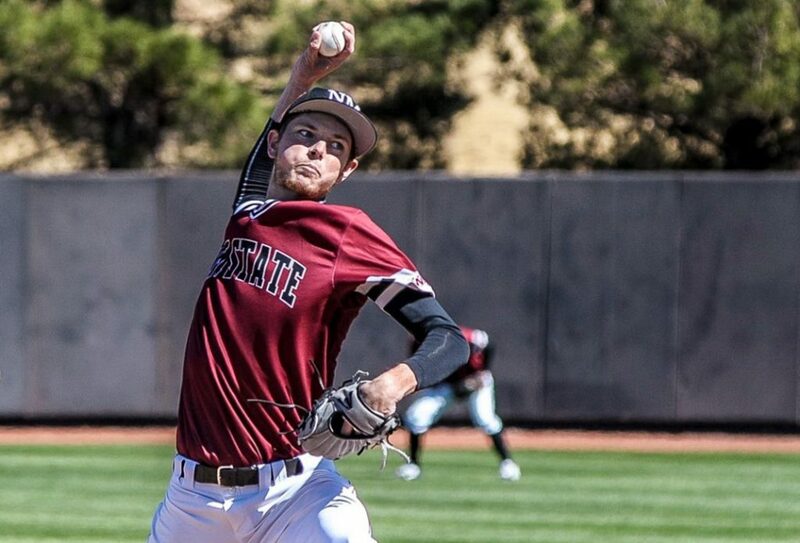 Currently, the New Mexico State baseball team is leading the nation in multiple team hitting categories including batting average, hits, runs, home runs and slugging percentage. According to d1baseball.com, Nick Gonzales is the No. 1 ranked second baseman in the nation. He currently leads the nation in batting average and is near the top in multiple other hitting categories. The baseball team is getting ready for its third weekend series against a WAC opponent as the Aggies host the Grand Canyon Antelopes this weekend at Presley Askew Field. The first game of the three-game series is Friday, April 5, at 6:05 p.m.